Published by Mountainblog on 12/20/2016 . Shoes for every season of the year: With its new collection, LOWA coffers a wide range of models that are just right for warm days in fall and frosty ones in winter. In thecfollowing interview, Alexander Nicolai, the head of development at LOWA, talks about the trends of thecseason. Everybody is talking about the urban outdoor trend. Will it continue? New approach shoe proves itself to be superior against 40 competitors in the category footwear. At this year’s award ceremony of the OutDoor INDUSTRY AWARDS the APPROACH PRO GTX® proves itself to be superior among 343 submitted new products. In the evening of the first trade fair day the official award ceremony took place in the Foyer Ost of the exhibition area. All together 37 products won an award, among them were eight GOLD Award-Winner. 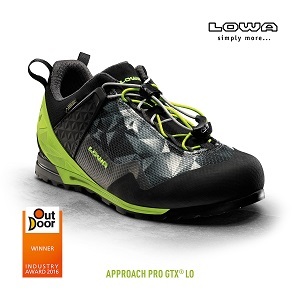 The new APPROACH PRO GTX® from LOWA is a light approach shoe, which is developed together with the mountaineer Luis Stitzinger. The shoe has a rigid insole, which makes light work of easy scrambling. In addition to this the shoe has a speedlace system, which allows individual adjustments in two different zones simultaneously. “With the new lacesystem Lowa has found a good and efficient solution. Moreover the stiff sole persuaded us with its good grip”, the jury said. In preparation of the trade fair awards an international jury of 12 picked 243 out of the 343 submitted products to evaluate for the next phase. In a second round the jury was reduced to six and these members selected the winners of the INDUSTRY AWARDS in a two-day workshop. Every single jury member could now nominate up to two products out of the winners, which should, in their opinion win a GOLD Award. Afterwards they fixed the final GOLD-Winners together. Published by Mountainblog on 07/20/2016 . 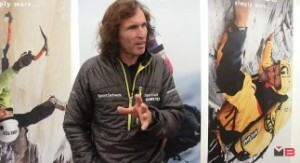 At OutDoor 2016, Tudor Dragomir (Export Area Manager LOWA) presents the Aerox GTX Lo and Lyxa Gtx Mid by LOWA. Published by Mountainblog on 02/03/2016 . ISPO 2016, Tudor Dragomir (Export Area Manager) and Holger Neu (Export Area Manager) present Innox Evo GTX® QC, Wendelstein Warm GTX®, Molveno GTX® Mid and Tortona GTX® Mid by Lowa. Published by Mountainblog on 01/22/2016 . 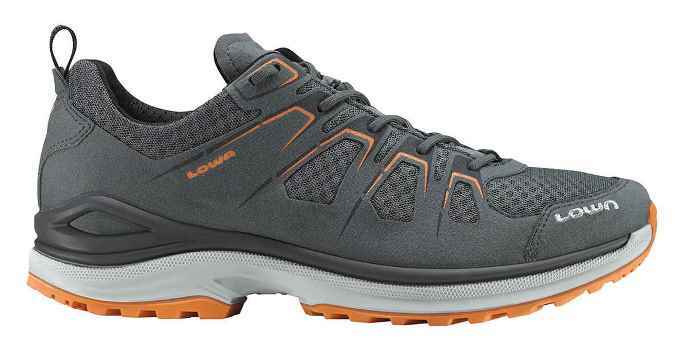 After extensive field testing, Terry Wieland, Gray’s Sporting Journal’s editor for the shooting category, chose the LOWA Tibet GTX Hi as a 2016 Gray’s Best winner. The award was presented with fanfare this afternoon in the LOWA booth at the SHOT Show going on in Las Vegas this week. With an abundance of accolades in the rear view mirror, the European-produced Tibet GTX Hi promises to be an integral part of LOWA’s hunting collection for a long time to come. 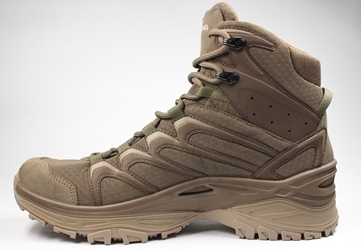 The Tibet GTX® Hi is designed for carrying heavy weights while hunting in any weather condition and over rugged off-trail terrain. It utilizes a high one-piece, water-repellent Nubuck leather upper with GORE-TEX® lining for waterproofness and breathability. The Tibet combines a Vibram® outsole that is crampon and snow spike compatible with a PU midsole package. LOWA’s patent-pending FlexFit/Tongue Stud, Balance Insole, Climate Control System, C4 Comfort Tongue System, AWP (Asymmetric Walking Position), and Spring Lace Hook System complete the package. The Tibet GTX Hi will be featured in Gray’s annual Expeditions & Guides 2016 issue later this year. Published by Mountainblog on 07/22/2015 . At OutDoor 2015, Alex Nicolai (Head of Design & Development) presents the Innox Evo Low, San Francisco GTX and Wendlestein by Lowa. 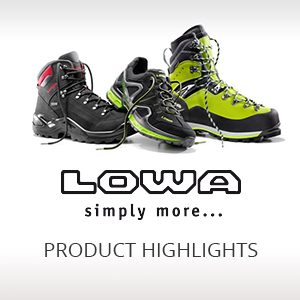 LOWA footwear is at home all around the world, be it on alpine terrain, hiking, walking or on urban outings. That’s being proved once again by the Bavarian heritage brand with its diverse range for spring / summer 2016. 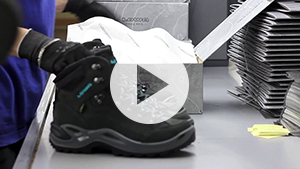 Extensive model refinements with great care to detailing and selective optimisation are distinguishing characteristics of the alpine, backpacking and trekking footwear. The Jetzendorf, Germany-based brand paid special attention to the soles, which show off superior craftsmanship and clever details. When it comes to ATC models, LOWA rounded out is range with two true all-rounders. The BORMIO GTX® and the TIAGO GTX® are comfortable, ready for many types of use and simply always a great choice. Be that choice a walk or an easy hike, and even if you head off meadows and trails. All Terrain Sport footwear has raced to a sure place on the shelves at retail and in the LOWA range. The models’ diversity and dynamics are impressive, and both are obvious in the design. The INNOX EVO is setting totally new standards in the category with the newly developed DynaPU® and its highly effective cushioning. and TEGERNSEE models combine a retro look with modern innovation. In recent years, another category has gained even more importance: Kid’s footwear. Their child-specific lasts, cool looks and real-world function win over both kids and adults alike. LOWA focuses on styles that take their cue from the adult world once kids grow into youth. Still, the footwear’s insides continue to be designed with a growing foot in mind. Published by Mountainblog on 07/13/2015 . 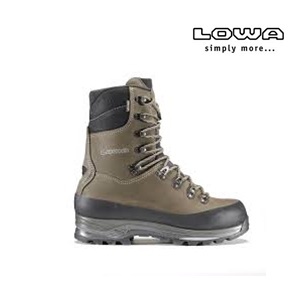 The LOWA Innox GTX® MID proved to be the winner of the comparative test done by the magazine „Alpin“ to be issued in June 2015, in the multifunctional footwear category. The testers expressed very positive opinions on the adaptability of the upper to the foot, on the softness of the collar, on the easy lacing; also the sole had positive acknowledgements for its flexibility and safe foot support. The boot obtained the best score for fitting, rolling and quality in the manufacturing. ”In the end a very balanced project, that responds in a perfect way to the requests of a light multifunctional shoe” : this is the final verdict of the “Alpin” magazine on the LOWA Innox GTX® MID. This award represents the successful achievement of a model which has been in the LOWA Outdoor collection for years, updated this year in the colors and presented during the Shot Show in Las Vegas and IWA of Norimberga. Also the customers in this trade show welcomed this new proposal with widespread curiosity and enthusiasm. Innox Evo represents a change on the market , as new materials have been used for the sole, the Lowa DynaPU. A new type of Polyurethane (PU) born from the research done by the R&D office in LOWA with the German company BASF, worldwide leader of PU. better cushioning: the new dynamic DynaPu offers to the user a very pleasant and comfortable sensation. With every step it is possible to feel the excellent cushioning and great dynamic and elastic action of the sole. more durability : the new PU foam offers long lasting duration, maintaining unchanged the original last and consistency, even after thousands of compressions. excellent comfort : the comfort increases due to the fact that cushioning system remains efficient also after extended use. Furthermore the sole is extremely light, as never seen before. Other advantages to be added to the new DynaPu are the benefits of the exclusive threedimensional design of the midsole Lowa Monowrap, that assures a direct connection of the sole with the upper through the midsole in PU, creating in this way a stabile e protecting junction for the foot where strains and fatigue of the terrain are greater. Europe, a strategic choice coherent with the company’s philosophy to offer high quality footwear, innovative and functional for the use for which they have been conceived. Published by Mountainblog on 06/26/2015 . Quality, Fit and Comfort are our main pillars in the boot making philosophy at Lowa. The product performance that results out of it this, is what customers appreciate in total from Lowa boots, no matter the outdoors where they go. In very demanding situations, terrains and in extreme cases this is even more important and crucial for the users. Lowa athletes are testing and help us improving little crucial details in our mountaineering and expedition boots but they also create also the emotion related to the outdoors and they awake in us the desire of going outdoors on new adventures. Quality, comfort and functionality make us No. 1 We aren’t satisfied with second best. For that reason we offer our customers only the highest quality, from materials to finished footwear. The guiding values for the high-quality of our products are the high expectations we place on ourselves and our service. The diligence of our talented employees and their never-wavering standards to construct the perfect footwear accompanies every phase of product development. Our service regarding every aspect of the footwear takes into account this standard. 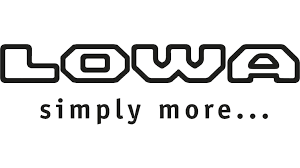 Where do LOWA Quality and Fitting Come From?